Halibut crews number from four to eight people on average. And with the industry consistently seeing approximately 3,500 halibut boats in a season this fishery offers plenty of opportunity for work. There are several common ports for halibut fisherman, of them including: Petersburg, Kodiak Island, Sand Point, Wrangell, Pelican and Sitka. These locations represent the best areas to work the Alaskan Halibut fishery. There are several methods effective for finding a job in the halibut fishery. Searching within halibut IFQ holders or local boat owners in the popular areas mentioned above are some of the best. When brought onboard as a new member of a halibut fishing boat you would be known as an “Inbreaker.” Like in the salmon fishing business, Inbreakers are offered a portion of the regular crew share during their first few times out to sea. After a trial period, the crew votes on their continued presence onboard. Crewmembers onboard halibut fishing boats are paid on a share system. This means that based on the number of fish caught and how much the fish earn from their sale, is distributed among the crew after deductions and owner’s share are paid out. It is important to keep in mind that the halibut season runs from March 1 to November 15. Some halibut captains choose to go after their quotas in the beginning of a season while others wait until the weather is warmer. Keeping an ear out on who is going out and when, will help you earn a spot on a good halibut boat that will yield high earnings. Additionally, halibut fishing can be slightly more dangerous because the equipment is more specialized and the process more unpredictable. Talk to as many ships as possible before agreeing to go onboard a halibut boat. As a point of safety, make sure there are survival suits for every person who will be aboard. The types of boats used for halibut fishing are generally split up between traditional longliners and similar boats with a more automated system of catching fish. 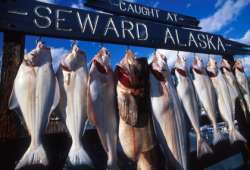 The traditional method is still widely used among fisherman and involves setting up about 10 miles of ground lines with bait that are played out until the halibut are harvested by hauling in the line. Crewmembers are responsible for removing fish, recoiling lines, tending and icing the caught fish as well as storing and hauling them. The lines (re-baited and set) are let out and the process, repeated. Back when halibut “derbies” were common, crew members would continue this process for up to 48 hours straight, during which they would try to catch as much as possible. These derby sessions are no longer used because of the ill effects they ultimately had on the halibut industry. Some longliners are much more automated, although the traditional method of halibut fishing is the most common.